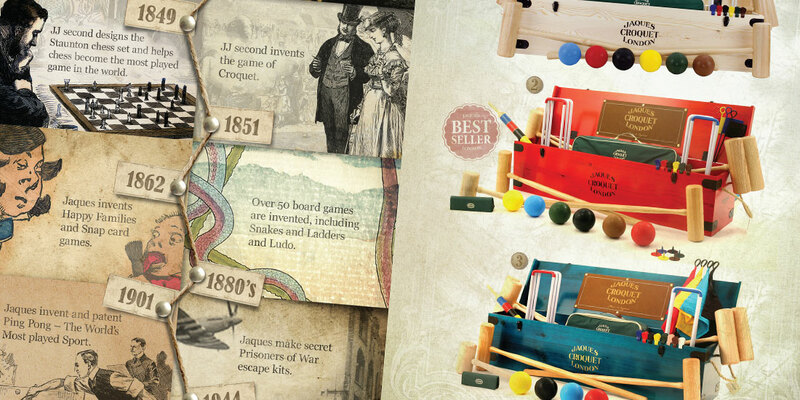 Jaques of London are the oldest sports and games manufacturer in the world and are responsible for the invention of Croquet, Ping-Pong, Tiddledy Winks, Happy Families and Snakes & Ladders. 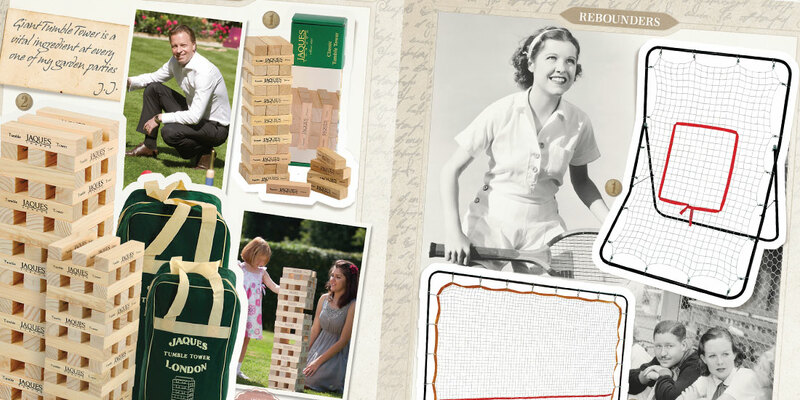 Jaques are still family owned and run by direct descendent of the founder, John Jaques, in 1795. Brandammo have been working with Jaques for more than seven years since 2006, providing a broad range of design and marketing services across both print and online. In addition to helping develop and refine their brand during that time, perhaps most significantly Brandammo launched Jaques’ UK and US e-commerce websites allowing them to sell directly to customers (where traditionally they have been a wholesale only business). With the run up to Christmas being one of the busiest times of the year for Jaques, Brandammo were asked in 2013 to design a print mailer to send out to 30,000 new and existing customers with a view to boosting awareness of their brand and products as well as generating sales over the period. At Brandammo we are lucky enough to have worked with Jaques over many years as their sole partner providing creative services both on and offline. Our close relationship with Jaques and our knowledge of their business and brand allows us to develop marketing materials that are content rich, historically accurate and 100% on brand every time. Ever since we began our partnership with Jaques we have worked towards re-focusing their brand in line with their rich and distinguished heritage whilst maintaining a contemporary edge. 2013 was the culmination of this effort and a chance for us to promote Jaques as the truly unique and distinctive company and brand it has become. 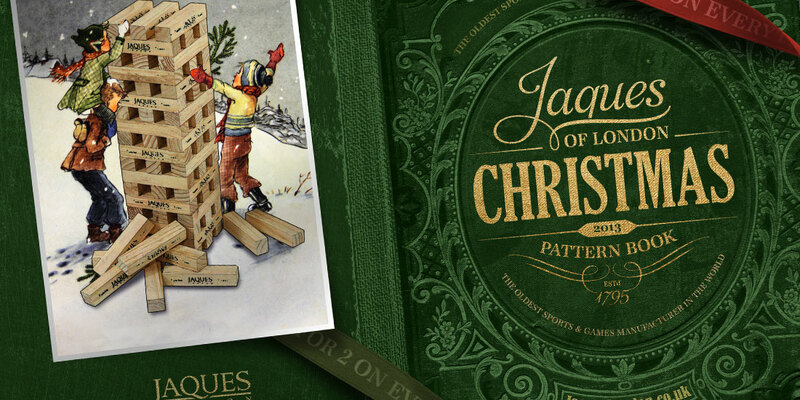 The 48-page 2013 Christmas mailer was designed through combining vintage textures, imagery and original Jaques design elements re-worked to create something truly unique, yet unmistakably ‘Jaques’. With the mailer being central to the season’s marketing efforts, the design was rolled out across a wider range of marketing material as well as online for complete brand consistency. 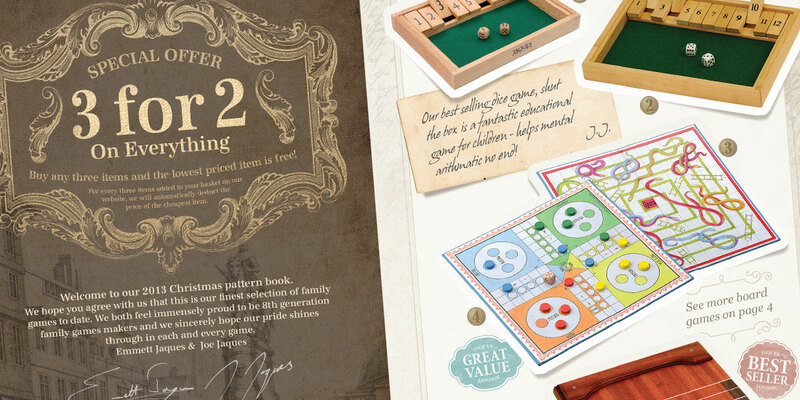 The 2013 Christmas mailer was incredibly well received and generated an unprecedented amount of positive feedback from customers both in the UK and across North America. Online sales over the Christmas 2013 period increased more than 26% with conversion rates increasing more than 38% due to consistent design and brand marketing across both print and digital. Over a relatively short period of time and with Brandammo’s help, Jaques’ consumer sales have grown rapidly from a standing start to become the primary source of revenue for the business. Furthermore, this growth shows no signs of slowing down and we look forward to working with Jaques to push their business to new heights over years to come.